By Sadiq Umar – The governor of Ekiti state, Ayodele Fayose, has vowed to file a N20 billion suit against the Economic and Financial Crimes Commission (EFCC) for placing him on watch list and directing that he should be arrested if he attempted to travel out of the country. 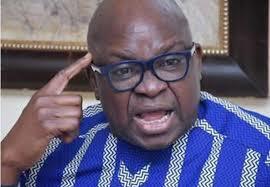 Mr. Fayose said the EFCC’s memo to border security agencies stance placing him on security watch list not only brought him to public ridicule but also violated his constitutional right to immunity as sitting governor. The governor said he would proceed with the suit if within 72 hours, the EFCC failed to write an apology to him to be published to all security agencies in Nigeria, three national newspapers and the social media as well as withdrawal of the request/directive to security agencies to place him on security watch list. According to Olayinka, the demands were contained in a letter by the governor’s counsel, Obafemi Adewale, dated September 3, 2018, which was received at the Abuja office of the EFCC on Friday. “By a letter Ref No: 3000/EFCC/ABJ/EG/TA/VOL.59/010 dated 12th September, 2018, you instructed all security agencies in Nigeria, including but not limited to the Nigerian Customs Service, NCC, to place our client on a watch list and to arrest him at sight upon ‘suspicion’ that he might be attempting to flee the country,” the letter read. “In your exact words, we quote: ‘The under listed suspect is under investigation in connection with the above mentioned offences and there is reasonable suspicion suggesting that he may likely leave the country either through the land borders, airport, or seaport in order to evade investigation. Hence, you are kindly requested to watch-list and arrest him,” it added. Mr. Fayose said the memo not only exposed him to ridicule, opprobrium, odium and hatred in the eyes of the ordinary man, but run foul of his constitutionally guaranteed right as a sitting governor. “By these words, you have not only fallen foul of the clear provision of Section 308 of the 1999 Constitution of the Federal Republic which grants our client, as an incumbent governor, immunity from any criminal process/proceedings, you have also exposed our client to ridicule, opprobrium, odium and hatred in the eyes and opinion of the ordinary man on the street and falsely and mischievously portrayed him as a common fugitive, a run-away from the law who could/should be arrested at sight like a dangerous criminal. the aforesaid request/directive to security agencies to place our client of the security watch list and arrest him at sight even whilst he still enjoys immunity as governor forthwith.